Originally from Portland Oregon, DeeLyn has resettled in the UK. She completed a design degree in Liverpool in 2010, specializing in jewellery and ceramics. She works predominately in sterling silver, but enjoys exploring alternative material as well. 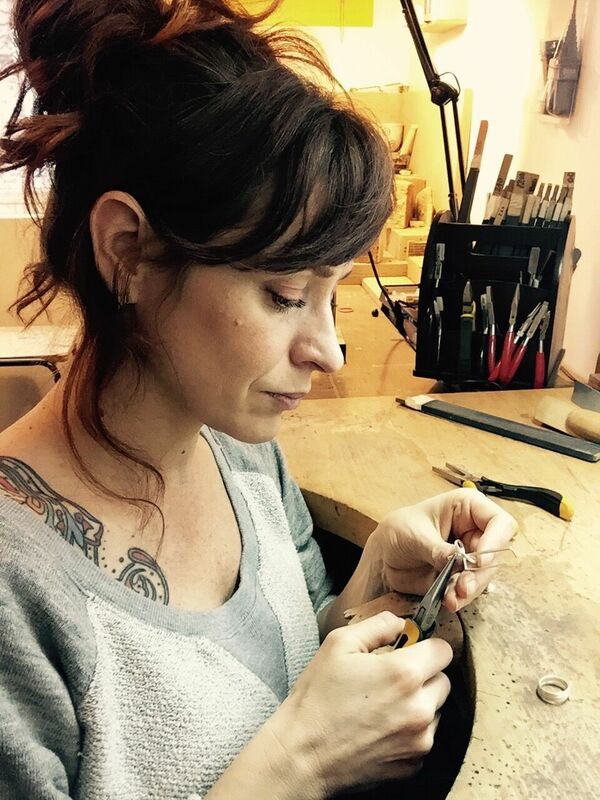 Since graduating, she has worked as a self-employed artist jeweller. She sells her work at select galleries and boutique shops throughout the UK & US. Repetitive rhythmical forms create complex geometric structures in the RE::strung collection. This range is crafted from recycled guitar strings and sterling silver. The innovative use of alterative materials and ingenuitive mechanisms add unique detail to the pieces. The Entanglement collection explores movement and structure using continuous lines & curves to form miniature sculptures that play with space and the wearer. The neckpieces are adaptable by the wearer and can be worn in a variety of styles. This range seeks to find a balance between the simplicity of complete order and the beauty in chaos (such is life! ).